I remember way back, when there was this time that for some reason, I thought that I was Lucifer Morningstar, God’s brightest angel. The twist, though, was that I was fallen from an evil God (of Gnostic myth), or that I was a version of Lucifer that never had fallen. The Gnostic one you probably never heard of, it was when Sabaoth rebelled against the Archons—the governing entities of the world—and Samael, the blind god, who was supposed to be the God of the Old Testament (but not the New). Blasphemy, that was, if you know your Bible and Christian canon; probably why there are so few Gnostics these days. Anyway, I wrote in the margins of the book where I read this, “the true Lucifer Morningstar”. That figure, though, I thought fit better with Jim Morrison, of all people. He always had a sort of “Lucifer” vibe to him. So basically, I just thought I was hot stuff. It was actually a step down from where my working area was then, namely, that I was the (new) messiah. The answer man. Around that time, I was waiting for my “superpowers” to kick in, whereupon I was going to hover in the air above New York City, holding an electric guitar (which presumably amplified itself), and thrash some tunes out better that Jimi Hendrix ever played. And then I would disappear. That’s all I had planned. It wasn’t a very well thought out messiahood. Oh, I did also have this dream that world leaders would come to me to seek my advice for really important matters. So really, I wouldn’t have needed the hypercharge of power that an omnipotent entity would have. Power was not really what I wanted. So the higher-ups, I think this is what happened, made me comfortable in something a little (a lot) less powerful. And yes, I did feel rather at home in the role of Lucifer Morningstar. It was the top of the food chain, because what is above you just blows out any notion of scale. Now there was this one time where I saw the spirits of people gathered in a sort of torso of mine, like what you see in the painting, Garden of Earthly Delights, near the center of the third panel, the Tree Man. Then I saw myself have an angelic spiritual form, circling above them, looking down on all the lower realities, each with their version of what happened anywhere they were aware of. 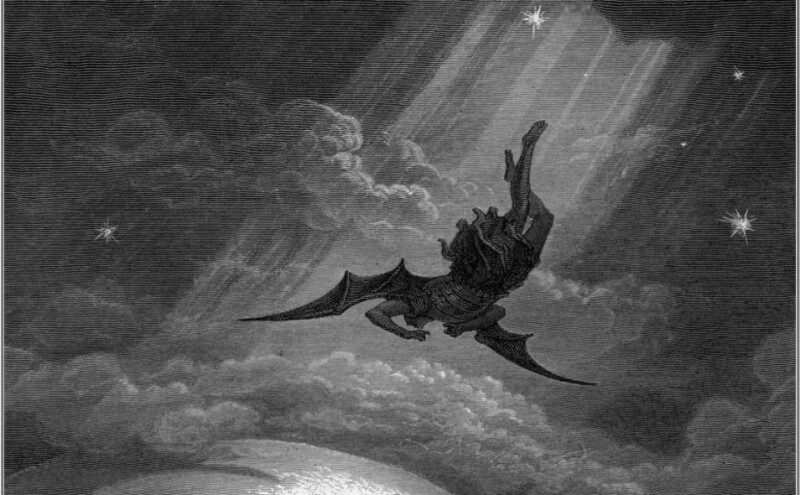 I said to them, “I am Lucifer Morningstar, and I speak to you from the most high reality, and the most high God, where there was no Fall.” I tried that tactic, in fact, several times—it never worked out; where there was a Lucifer, there was a Fall. This was indeed a sign. What I didn’t know then about those “realities” was that the actual Lucifer was looking through them, seeing which one to choose to solidify, from his perch in the original Heaven. And of the “realities” only one became the One when he decided to commit his full forward evil to it. And another thing: whenever I thought I was Lucifer, there was always a Michael. In the longest stretch of that belief, when I was the hypergenius Lucifer Morningstar, there was Albert Einstein who was Michael—and no matter what I did, I could see that I could not get past him, that he would ultimately defeat whatever I could muster. Indeed, it seemed by all counts to be intrinsic to the system that is the universe. And back then, you know, I always thought that I was one of the good guys, but maybe it could be true: I got caught up in the lies of him who deceiveth the whole world: the Dragon, the Serpent, Satan, the Devil. Who was once Lucifer, the greatest being in the whole of creation. Now the Father of Lies, who was a murderer from the first. I don’t remember exactly what it was that made me think that I was him, if unfallen. I recall that I certainly didn’t want to be Michael, the secondmost. I thought Michael lost the War in Heaven, and I didn’t want to be left out of all the stuff that was coming to me in Paradise. Around that time, I remember curling up naked on the carpet, living in my head this one of several times, when the War took me over; I remember a voice that booming repeated, which I could have sworn was Walt Disney’s voice (because as you know, Walt Disney is God): “Michael… Michael… Michael…”: calling to me, like the sound of doom… Somehow I switched, the next step in my progression in powering down. Perhaps it had been all the psychological experiences I encountered when I identified with Lucifer, that it could never be what I had wanted it to be, since the Fall was written in the ground of reality itself. And I was then Michael. Of course, there was still a problem with this conception of things, as angels are not human beings and human beings are not angels—in fact, human beings do not become angels when they die and go to Heaven (a common fallacy). It was just a gradual talking me down, I suppose you could say, for I had once thought I was God, and Jesus, and then a separate messiah from Jesus, then Lucifer. I only had a couple steps to go. Long story short, by turning me into Michael, the higher ups were curing me of my messiah complex. Michael is a faithful and humble servant of the Lord, whatever power he possessed. And from there to be a prophet, who of course is of the correct species of mine. And pretty much that’s it, since I am a prophet. But those days as Lucifer taught me a few things. Being called Lucifer in real life carries with it a sting, which I hadn’t counted on, because you’re dealing with the outside world, now—and Lucifer is not one of the good guys in that world. Nice in concept, horrible in practice. Also, if Lucifer is the good guy, and God is the bad guy, you cannot explain much of the world or the universe. It just doesn’t make sense. And lastly, it’s better to be second and saved, than one who cries, “Better to reign in Hell than serve in Heaven.” No, just no. It’s better to serve in Heaven. Lucifer has been glamorized, and it is understandable why. Being the being with the greatest of powers, he nonetheless is the underdog when he rebels against God Most High. Teenagers, especially, can relate: how it is that those in power (like the parents) just don’t understand, and the higher ups should listen to them for a change. But being like how teenagers have just enough knowledge to be dangerous, Lucifer was blinded by his pride. It was no glamorous thing that he did. Simply put, every bad thing that has happened, and happened to you, is due to Lucifer Morningstar, greatest and stupidest of all the angels, who actually broke part Heaven in inventing his magnum opus, which happened to be…? Well, what is the worst possible thing? Wouldn’t that be… pain? Also known as error, and most commonly, Sin. Then there would be Death, after Lucifer sexing it up with Sin: Death, the Son of Satan. Because they were embodiments, Sin, Death, and now Lucifer: Evil. This is why true Satanism has no redeeming qualities to it. There was nothing noble in rebelling against a God who was truly all good. We look around here, on earth, and we can point to things that are unfair about the world, and we’re like, how about these, God? And then I tell you, those things are all Lucifer’s fault, to the least discomfort. God has never done you wrong, or anybody. That’s the Devil you’re thinking of. He does it to you and then blames God for it, then says to follow him down into his morass of iniquity. Remember, as it is written in Revelation, he deceiveth the whole world. How did the Rolling Stones song start? “Please allow me to introduce myself, I’m a man of wealth and taste.” That’s the picture he would like you to have of him. The reality is that to behold the true being that is Satan would probably make you wretch, or worse. And anyone who thinks doing evil is fun, that one would go out of one’s way to harm someone else for no reason, for evil’s sake—all I have to say is that I don’t understand you. There were times in the past where I wanted to get even with someone, to do damage back to its source, but to proactively do harm I have rarely desired, going back to childhood for instances. I grew up. Once I thought that evil was just a form of immaturity, but the levels that some people take it to outstrip the worst of what immaturity can explain. The immature stop bitching when they get what they want, but evil is insatiable. So go ahead, joke about it: be the Devil’s advocate, call him Lord Satan, sing along to heavy metal songs about worshipping Evil itself. I tell you from our end, Jesus understands (he gets you! ), and that you know not what you do. But know this: the real deal is nothing to laugh at, and nothing to give your allegiance to. Do not make friends with Death—and expect not to die.